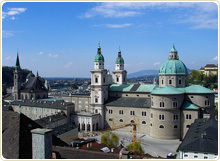 The Cathedral of Salzburg or Salzburger Dom is the largest and most impressive church in the city, named after its patron saint - St Rupert of Salzburg. It is the centre of the religious life of the region and the seat of the local archbishop who had been once a strong sovereign ruler for centuries long. The church is one of the most remarkable representatives of the early Baroque architecture in the area north of the Alps, featuring a splendid façade and a majestic dome. Here the famous composer Mozart was baptized. The cathedral occupies a sacred place which was honored even in the ancient times by Celts and then Romans. According to the legends the first Christian temple on the site was built by St Rupert. But the historic records tell us that the first cathedral here was completed in 774 by the local Bishop Virgil and dedicated to St Virgil and St Rupert. Later in the first quarter of the 9th century the church was renovated by the Archbishop Arno but unfortunately in the middle of the century it was stroke by a lightning and a larger part of it burnt. Soon the cathedral was rebuilt and in the beginning of the 11th century Archbishop Hartwig added a choir and a crypt. In the first half of the next 12th century Archbishop Conrad I completed the two towers flanking the façade. This early cathedral had all characteristics of a classic Romanesque basilica. In the end of the 16th century a large fire severely damaged the basilica. The prince archbishop of that time named Wolf Dietrich was a prominent admirer of the Baroque architecture spreading in Italy at that time. So he decided to fully demolish the remains of the old Romanesque basilica and to build a new cathedral entirely in the spirit of the modern Baroque architectural style. The residents of the city were very angry with the consequences of this decision of the archbishop as not only the old church but also the old graves of the previous bishops and archbishops were destroyed and their bones scattered. Archbishop Wolf Dietrich commissioned the talented Italian architect Vincenzo Scamozzi to design the plan of the new cathedral. But the construction works were postponed as the archbishop involved in a serious conflict with Bavaria over the rights of the very profitable salt mines in the region. Following this conflict Wolf Dietrich was imprisoned in the Hohensalzburg Castle. His successor Markus Sittikus von Hohenems was the archbishop who hired another prominent Italian architect of the time - Santino Solari and rebuilt the city’s cathedral, turning it into the earliest and one of the most remarkable Baroque churches north of the Alps. The new Dom was officially consecrated with pompous celebrations in the years of Prince Archbishop Paris Graf von Lodron (1619 – 1653), who also strengthened the city fortifications with new walls and with brilliant diplomacy managed to keep Salzburg almost untouched by the destructions of the Thirty Years' War (1618-1648). The sovereignty of the Salzburg's archbishops was taken away by Napoleon and the last Prince Archbishop Hieronymus von Colloredo was dethroned. The city came under the rule of the Habsburg Empire. In the World War II the allied American and English bombing raids destroyed a considerable part of the Cathedral. In the years after the war it was reconstructed in a faithful way and consecrated for a third time in 1959. The years of the three consecrations of the Dom 774, 1628 and 1959 are inscribed on the monumental gates of the church. The graceful façade of the Dom is decorated with 3 arched monumental gates, flanked by the sculptured figures of the first apostles: St Peter and St Paul holding keys and the statues of the two patron saints of Salzburg: St Virgil and St Rupert. The two coat of arms represented on the gable are those of the two builders of the Cathedral: the prince archbishops Markus Sittiku von Hohenems and Paris Graf von Lodron. 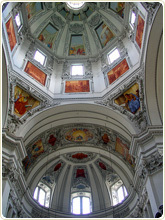 The highlights inside the Cathedral include the church font where the famous composer born in the city - Wolfgang Amadeus Mozart was baptized, the wonderful organ decorated with figures of angles playing on various musical instruments and the statues of the patron saints on its top, as well as the splendid portals of the Dom.